 Harrisburg’s City Council is the Legislative Branch of City government. The City Council consists of seven members who are elected at large. The City Council President is elected by the Council members and presides over the Council meetings. In the event of illness or absence, the Vice-President presides over the meetings. City Council considers and evaluates legislative concerns through a study committee structure consisting of committees on Administration, Budget & Finance, Building & Housing, Community & Economic Development, Parks, Recreation & Enrichment, Public Safety, and Public Works. City Council also confirms all department directors and certain other Mayoral appointees. Council is also required, by the Third Class Optional City Code of Pennsylvania, to pass an annual budget by December 31st of each fiscal year. 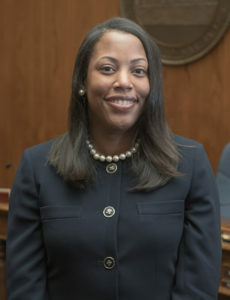 Council Member Shamaine A. Daniels, Esq. How do I get into contact with City Council? City Council members are part-time employees. Therefore, they do not have typical office hours at City Hall. 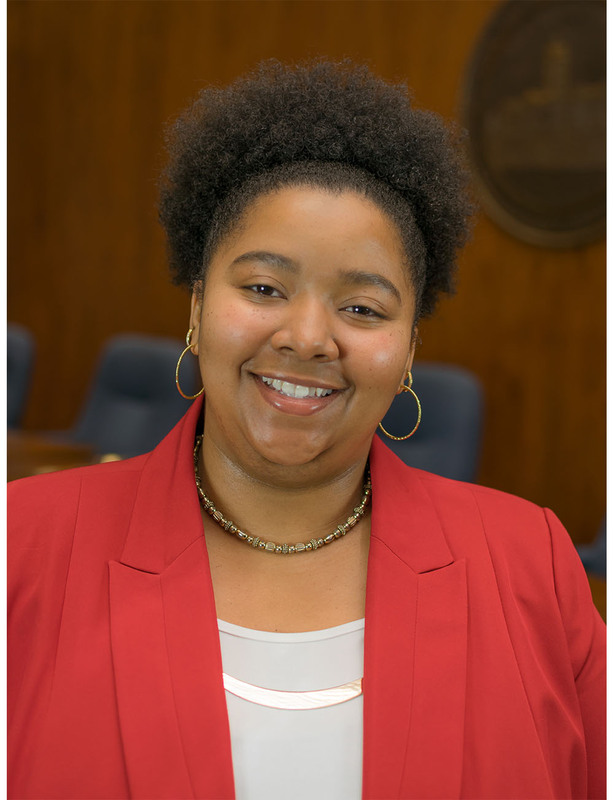 If you need to contact a certain Council Member you can either contact the City Clerk at 717-255-3060 to arrange an appointment or visit the Office of City Clerk / City Council located in Suite #305 of the Martin Luther King Jr. Government Center on 10 N. 2nd Street, Harrisburg, PA 17101.
Who is the City Clerk & What does he do? 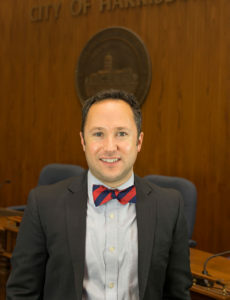 Kirk A. Petroski is the City Clerk for the city of Harrisburg. 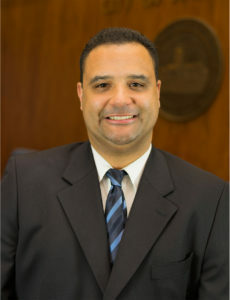 Kirk is a graduate of Bishop McDevitt High School; he obtained his Bachelor’s Degree in Communication Arts from Neumann University and his Master’s Degree in Communication Management from LaSalle University. 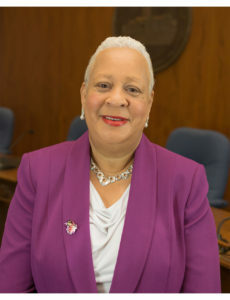 Prior to joining the City of Harrisburg in 2009, Kirk worked as Special Assistant to former Philadelphia District Attorney Lynne Abraham from 2003-2009. 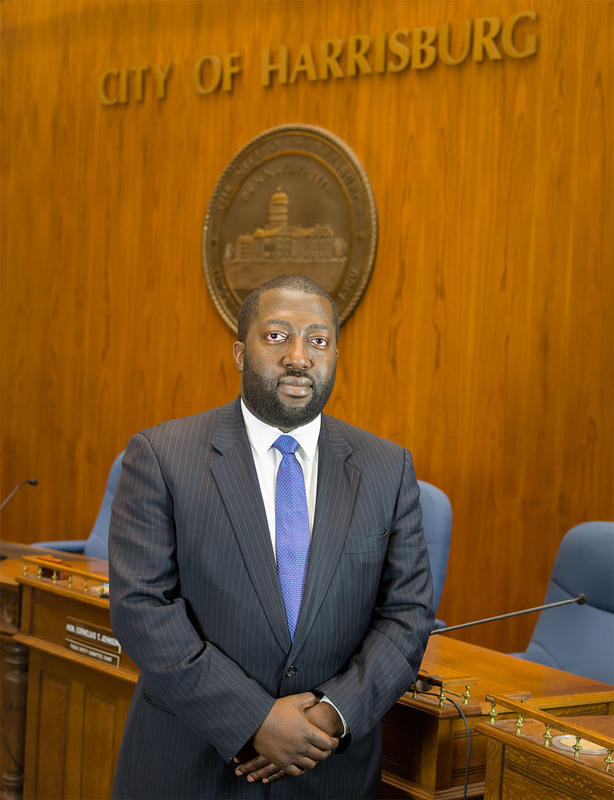 Kirk provides Administrative support to Harrisburg City Council. 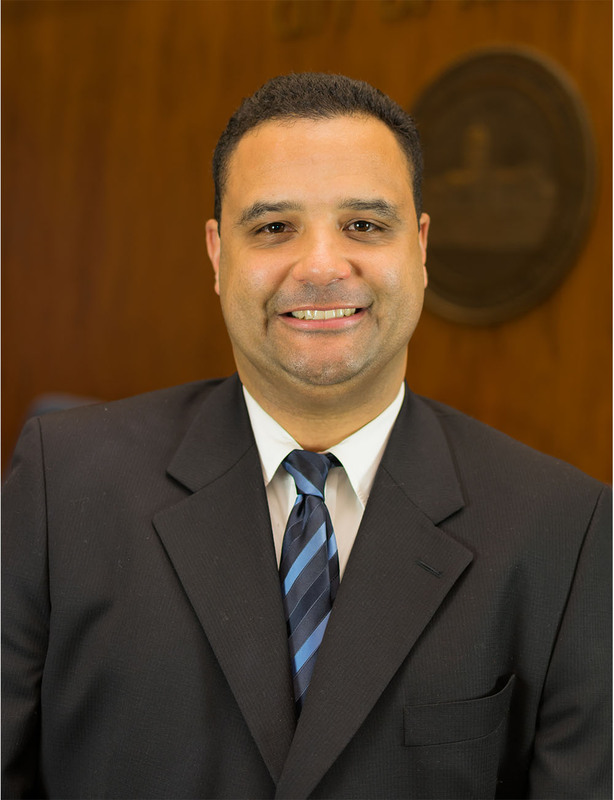 He acts as the Director of the Legislative Branch, responsible for managing the day-to-day operations of City Council by providing leadership and administrative support. 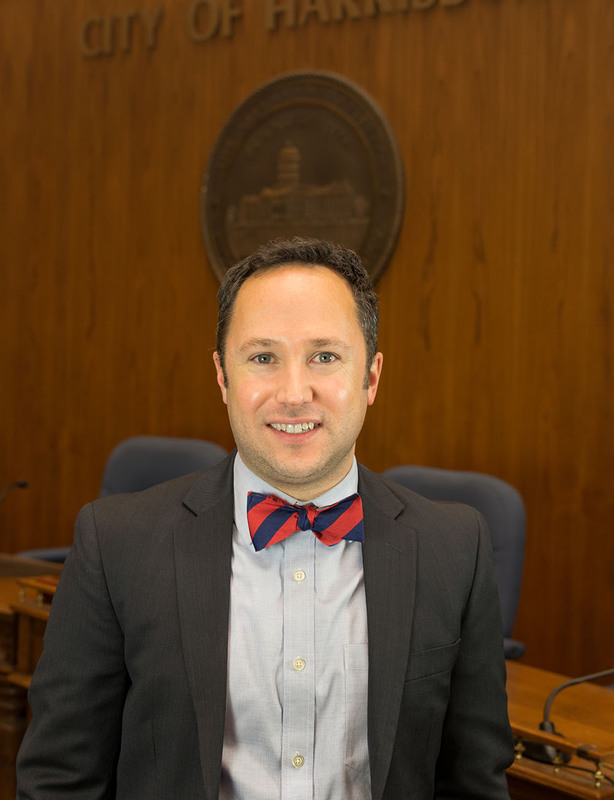 The City Clerk maintains accurate legislative records and performs other services for the body of Council such as legal research, drafting and reviewing ordinances, public relations and he acts as a liaison with the City Administration and other entities. The City Clerk assists Council in areas such as setting agendas, developing action plans, coordinating appointments for the City’s Boards, Authorities and Commissions. What are the City Council Committees? A. ADMlNISTRATION: All matters relating to nominations, appointments, personnel policy, personnel administration, Department of Administration, and related City agencies. This Committee shall review all legislation being considered to support matters at federal, state and regional levels. B. BUDGET AND FINANCE: All matters relating to contracts, budget, finance, taxes, indebtedness, bond issues, penalties, the operating and capital budgets, water and sewer rates and fees. D. COMMUNITY AND ECONOMIC DEVELOPMENT: Specific Matters related to subdivision and land development plan approvals, the Federal Community Development Block Grant Program and the administration of the city’s entitlement of CDBG funds. E. PARKS, RECREATION & ENRICHMENT: All matters falling within the jurisdiction of the Department of Parks and Recreation, including but not limited to: Art Education, Special Events and Festivals. The Youth Commission shall report to the Chair of Parks, Recreation & Enrichment. F. PUBLIC SAFETY: All matters falling within the jurisdiction of the Department of Public Safety; the Bureaus of Fire and Police and City Codes Department. Public Works and its related authorities; transportation issues and projects, sustainability and livability objectives. The Environmental Advisory Council shall report to the Chair of Public Works. RULE NO. 1. At its organizational meeting required by law on the first Monday of January following the regular municipal election, the members of City Council shall assemble in Council Chambers at 12:00 p.m. (noon) and organize and elect a President and Vice President of the Council, by majority vote, from among its members to serve a two (2) year term. If the first Monday is a legal holiday, the meeting shall be held on the first day following. In the event the President of City Council is unable to complete his/her term, for whatever reason, City Council shall, within thirty (30) days of notification, duly elect a new President to serve the remainder of the term. Pending said election, the Vice President shall preside. In the event that the Vice President of City Council is unable to complete his/her term, for whatever reason, City Council shall, within thirty (30) days of notification, duly elect a new Vice President to serve the remainder of the term. RULE NO. 2. Council shall meet in Legislative Session at 6:00 p.m. on the second and fourth Tuesday of each month in Council Chambers, preceded by a non-voting review session at 5:30 p.m., but Council may adjourn from time to time. When such days fall on legal holidays, the regularly stated meeting for such day shall be held at the stated time and place on the next day. Special meetings may be called by the President or upon request of four members for special business, and no other business shall be considered. Each member shall have at least twenty-four (24) hours’ notice of special meetings, or they may waive the same. 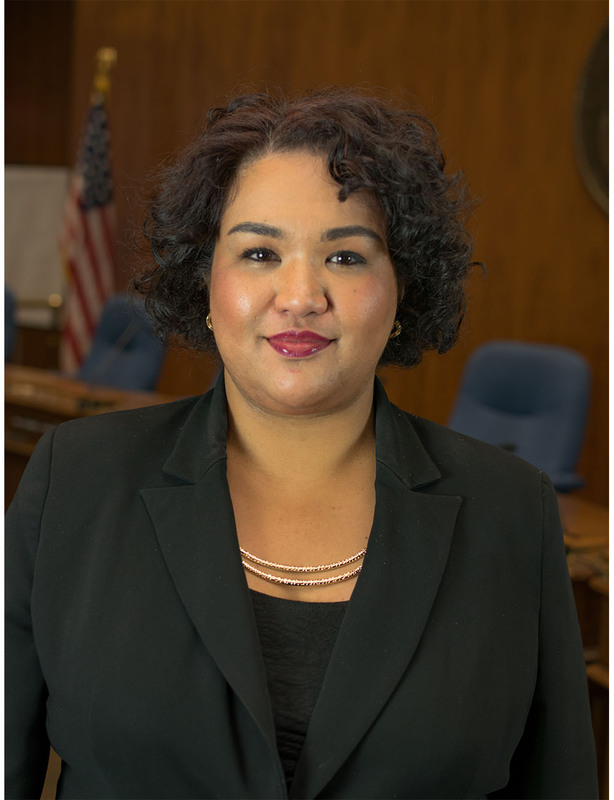 If a member is unable to attend a Legislative Session or Special Legislative Session, said member shall notify both the City Clerk and the President of Council of his/her absence as soon as practicable. RULE NO. 3. The President shall call the meeting to order and shall preside. In the absence of the President, the Vice President shall serve as the Presiding Officer. If both the President and Vice President are absent, the meeting shall not be called to order unless the President has designated a member of Council, in writing, to serve as Presiding Officer of that session. No Legislative or Special Legislative Session of Harrisburg City Council shall be called to order with or without a quorum in the absence of the City Solicitor or a staff attorney from the Law Bureau. RULE NO. 4 City Council members must avoid conflicts of interest between the member and the business of the city of Harrisburg. Any situation that involves, or may be reasonably expected to involve a conflict of interest with his/her duties and decisions as a City Council member should be promptly disclosed to the President and all other Council members. A conflict of interest can occur when a member’s private interest interferes or influences in any way, or even appears to interfere with or influence, the interests/decisions of the Council body. The President shall consult with the City Solicitor as to what is the appropriate action to be taken to deal with the conflict of interest and the member shall abide with the recommendation of the City Solicitor. RULE NO. 5 The Standard Code of Parliamentary Procedure by Alice Sturgis (most current edition) shall govern the proceedings of the Council on all matters not specifically provided for herein. The Solicitor shall serve as the Parliamentarian. RULE NO. 6 Proposed amendments to these Rules must be presented in writing to the Chair of the Administration Committee. The Chair of the Administration Committee shall provide all members of Council with said proposed Rule change(s) and shall hold an Administration Committee meeting to review same within 30 days from receipt. Rule changes shall be voted on at a regular or special legislative session and shall be adopted only by the affirmative vote of two-thirds (2/3) of all members of Council. RULE NO. 7 These rules may be suspended by the affirmative vote of the majority of all members of Council present, but such suspension shall not extend beyond adjournment. No Rule of Council which is a subject of legislative enactment shall be suspended. RULE NO. 9 Courtesy of the Floor is the order of business during which residents or taxpayers of the city of Harrisburg may address Council on any matter of concern, official action or deliberation which is or may be before City Council, prior to taking action. A sign-in sheet shall be prominently displayed, and all persons wishing to address Council must print their name, address and telephone number or e-mail address. The President shall set guidelines for such courtesy and has the option of establishing time limits consistent with the number of people who will address the members. The President shall refer all questions/issues to the appropriate committee for further review, if necessary. The President has sole discretion as to which committee any matter is assigned. RULE NO. 10 No Resolution or Bill shall be considered by Council unless the same is delivered to the City Clerk by noon of the Friday preceding the Council meeting. The City Clerk shall furnish all members of Council and the Mayor with copies of the proposed agenda after it is approved by the Council President. All legislation must be reviewed by the City Solicitor, or his/her designee, and such review will be indicated by the signature or initials of the same. 1.) On the first Monday of January following the regular municipal election, the members of Council shall assemble in Council Chambers at 12:00 noon and organize and elect a president and vice president of Council from among its members. If the first Monday is a holiday, the meeting shall be held at the same time and place on the day thereafter. The Parliamentarian shall preside at the meeting until the President is elected. 2.) The President of Council shall have general supervision of all Legislative Sessions and Special Legislative Sessions. 3.) The President shall be responsible for overseeing the general administrative and fiduciary functions of the office of the City Clerk. The City Clerk shall be responsible for all administrative, fiduciary, and day-to-day operations of the office of the City Clerk, including employee supervision, work assignment, leave requests, and evaluations. The President shall be responsible for approving the leave requests of the City Clerk, reviewing and approving the office Budget prepared by the City Clerk, signing contracts, bonds, and the annual financial statement provided to the Commonwealth of Pennsylvania. 1.) The Vice President shall preside over all Legislative and Special Legislative Sessions in the absence of the President. The Vice President shall represent Harrisburg City Council at functions and perform other requirements normally done by the President, in the President’s absence. A. Every legislative act of City Council shall be by Ordinance and every act of policy shall be by Resolution, both having passed Council, signed by the President of Council, and attested to by the City Clerk. B. All Bills to be given first reading and Resolutions to be considered shall be introduced in written form as Bills or Resolutions and shall be numbered serially for the calendar year. No Ordinances shall be passed containing more than one subject, except for general appropriation Ordinances. C. The title of every Bill shall be read when introduced, if amended, and on final passage. A complete copy of every Bill introduced shall be available for public inspection at the City Clerk’s Office during regular office hours. Upon final passage, Ordinances shall be numbered serially for the calendar year. D. A majority of the whole number of members of City Council shall constitute a quorum. No Resolution or Ordinance shall be adopted by City Council without the affirmative vote of a majority of all members of Council. E. The vote upon every Motion, Resolution, or Bill shall be taken by roll call, and the yeas and nays shall be entered in the Minutes. The Presiding Officer shall vote last on all questions and may take part in debate without leaving the Chair. F. All Ordinances shall be adopted and published in the manner required by general law. G. The City Clerk shall record all Ordinances and Resolutions adopted by Council and at the close of each year, with the advice and assistance of the City Solicitor, as required by law, shall bind, compile, or codify all of the Ordinances and Resolutions, or true copies thereof, of the City which then remain in force and effect. The City Clerk shall also properly index the record books, compilation or codification of Ordinances and Resolutions. H. No rule or regulation made by any department, officer, agency, or authority of the City, except such as relates to the organization or internal management of the City government or a part thereof, shall take effect until it is filed either with the City Clerk or in such other manner as may be provided by Ordinance. The Council shall provide for the prompt publication of such rules and regulations. I. Ordinances adopted by the Council shall be submitted by the City Clerk to the Mayor within seventy-two (72) hours after passage, or as otherwise required by law. RULE NO. 13 A motion to reconsider shall be entertained only on Motion of a member who voted in the affirmative on the matter and may only be brought at the next legislative meeting (regular or special) following the one at which the vote was taken. RULE NO. 14 The Presiding Officer at a meeting of City Council may announce that the Minutes, a report, or communication is received and accepted and that this action shall be so noted in the Minutes. This shall not exclude the right of any member of City Council to move that a report or communication be referred to a committee or other appropriate body. RULE NO. 15 The President of City Council shall appoint the following standing committees with duties that include, but are not limited to, the matters as indicated. When a matter can me placed in more than one committee, the President shall solely determine the appropriate committee to which that matter shall be assigned, on a non-precedent setting basis. A. ADMINISTRATION: All matters relating to personnel policy, personnel administration, Department of Administration, and related City agencies. B. BUDGET AND FINANCE: All matters relating to budget, finance, taxes, Indebtedness, bond issues, penalties, the operating and capital budgets, water and sewer rates and fees. C. BUILDING AND HOUSING: All matters related to the activities of the Department of Building and Housing Development, or its successor, related municipal authorities, the rehabilitation of the housing stock within the city, and matters concerning the Harrisburg Architectural Review Board (HARB). E. PARKS AND RECREATION: All matters falling within the jurisdiction of the Department of Parks and Recreation. F. PUBLIC SAFETY: All matters falling within the jurisdiction of the Department of Public Safety; the Bureaus of Fire and Police. G. PUBLIC WORKS: All matters falling within the jurisdiction of the Department of Public Works and its related authorities. Council may establish special committees, as needed. The President of City Council shall serve as an ex-officio voting member of all committees. 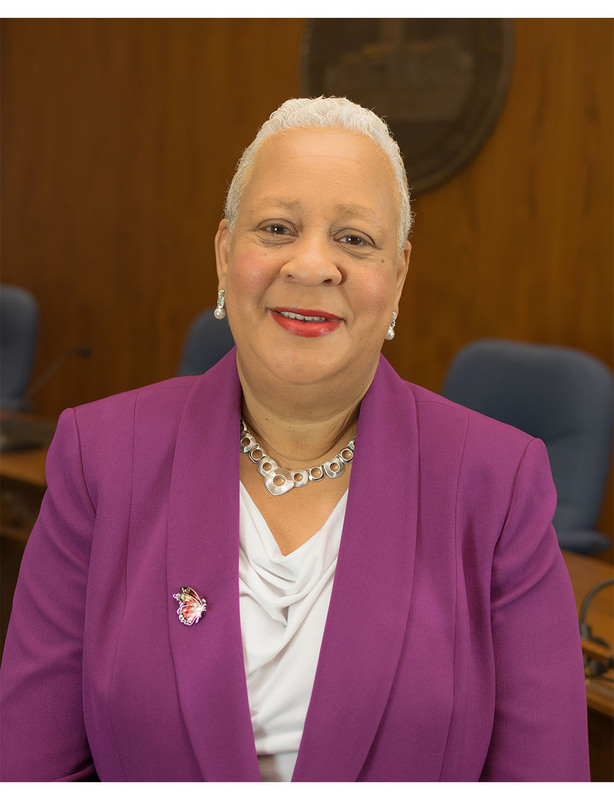 No committee meeting will be held prior to 5:00 p.m. and all committee meetings will be held from Monday through Thursday only, unless a majority number of Harrisburg City Council agree to change the date and/or time. A. Property owners and/or interested parties who make a request of City Council for street vacations, openings, widenings, easements, rights-of-way, special exceptions, appeals, or any other waiver or action which requires public advertisement, stenographic services or other costs must pay a fee equal to the costs incurred by the Office of the City Clerk prior to the final passage and receipt of a certified copy of City Council’s actions. B. Applicants for such actions as noted in (A.) above shall be notified of the fees at the time the action is requested of City Council. C. Upon written request of the applicant, fees may be waived by City Council upon a two-thirds (2/3) majority vote. RULE NO. 17 No items shall be removed from a committee and placed on City Council’s agenda without the approval of the Committee Chair, unless it is approved by a two-thirds (2/3) majority vote of City Council. A. 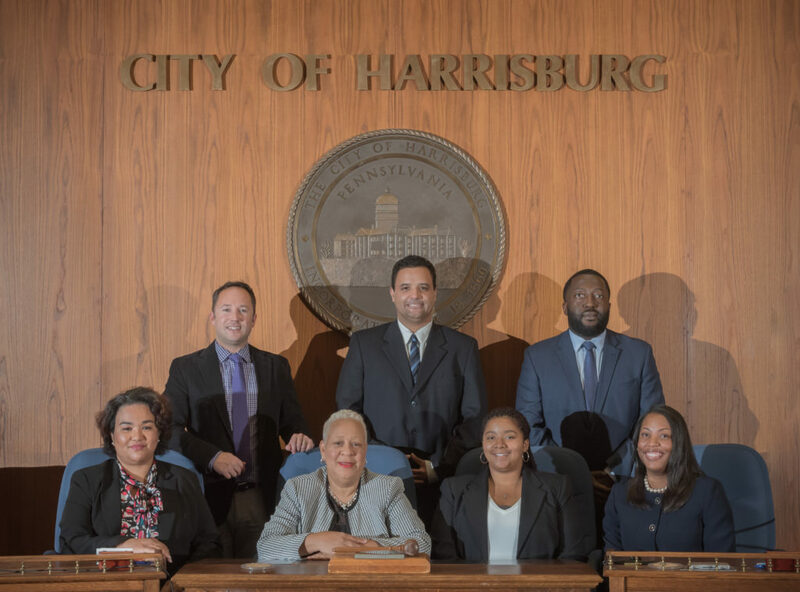 Each step in the process, from interviewing to setting final agreement terms, conditions, and restrictions, shall only be authorized by passage of a resolution of Harrisburg City Council, approved by a minimum of four votes. B. No individuals or professional firms shall be contacted or approached by any member of City Council or staff, in order to discuss the terms, conditions, general or specific nature of representation, reviews related to financial requirements, at any time, unless authorized by passage of a Resolution of Harrisburg City Council. C. The President of Harrisburg City Council shall be the designated representative of the body, who shall communicate the intentions of City Council with respect to professional service contracts for “as needed” services, which can only be authorized upon a vote called by the President with a minimum of four votes for approval. D. Termination of any professional services contract for “as needed” services can only be Authorized by passage of a Resolution by four members of City Council. E. After all individuals/firms have been contacted in writing and all requested materials have been furnished, City Council shall meet in the Administration Committee and follow all rules pertaining to the further disposition of business. RULE NO. 19 No video taped session of City Council shall be edited by a videographer for any reason without or unless a majority of City Council members agree that the deletion is warranted by law and that the content will not otherwise be altered by said edit. Before any said edit is made, the videographer must submit a written explanation for this edit to all members of City Council and it must be approved by the majority of City Council members. RULE NO. 20 All Legislative Sessions of Harrisburg City Council shall include the Pledge of Allegiance to the flag of the United States of America as the first order of business after the Invocation/Moment of Silence.